From the dark depths of his vampyre world, a vampyre boy reflects on the joyous days of his childhood and his current life as a vampyre. 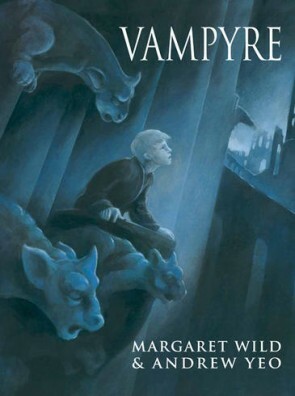 Thought-provoking and atmospheric, Vampyre is a monumental picture book about identity, making choices and being true to oneself from award-wining author, Margaret Wild, with breathtaking illustrations by illustrator, Andrew Yeo. Margaret Wild was born in South Africa and came to Australia in 1972. She has been a journalist on newspapers and magazines, and she worked as a book editor in children’s publishing for sixteen years, responsible for managing and commissioning a large range of titles. She lives in Sydney and now writes full-time. Andrew Yeo is a talented new illustrator from Sydney, Australia. Vampyre is his first picture book.